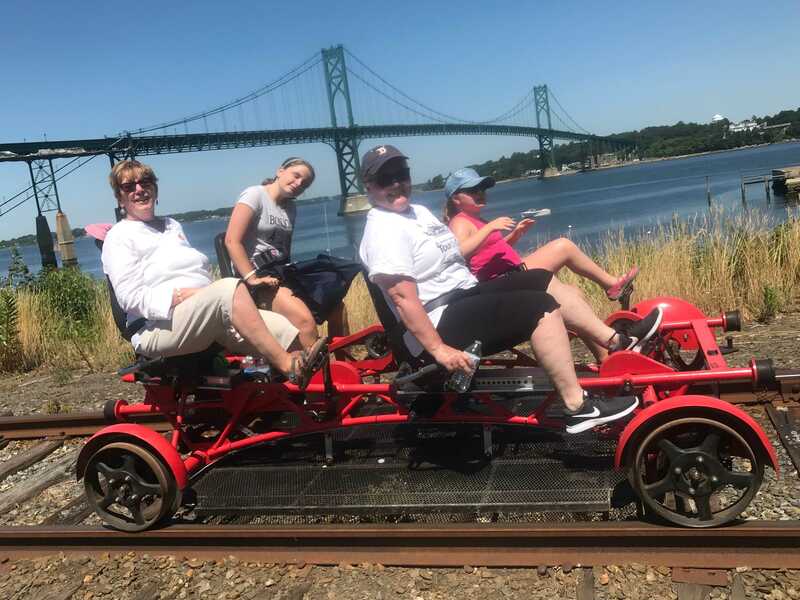 Join us on Thursday, June 13, 2019 as we ride the rails, enjoy lunch, and explore downtown Newport on our spring recreational outing. Our day starts at 8:45AM as we board a deluxe motor coach at INSIGHT for the quick ride to Portsmouth where we will prepare to ride the rails. Rail Explorers provides each participant with the unique opportunity to help pedal a two or four person rail car down a six mile stretch of train tracks. Along the way we will pass the topiary gardens, Carnegie Abbey Club, and the Mount Hope Bridge. After our adventure we will head to the Mooring Restaurant where we will enjoy a lunch that will include a mixed greens salad; the choice of a chicken salad croissant, a classic reuben, an Angus Beef burger, or a New England cod sandwich; as well as the choice of chocolate cake or creme brulee for dessert. After lunch there will be some free time for each person to browse the shops or relax by the sea before we head back. We expect to be at INSIGHT by around 4PM. There is a limit of 28 people for this trip. Tickets, which are available on a first come, first served basis, are $40 for people with visual impairments and $80 for a sighted guest. The ticket price includes roundtrip motorcoach transportation from INSIGHT, Rail Explorers, lunch, and gratuities for the bus driver. A deposit of $15 per ticket is being accepted to hold seats for the trip. Final payments are due by May 23, 2019. Full refunds will be made only for cancellations received before May 10. Please note that this trip does include a moderate amount of physical activity, including helping to pedal the car down the track and walking in downtown Newport.